When the engine is running or the ignition switch is ON, the power window regulator motor assembly (for rear RH side) is operated by the power window regulator switch assembly (for rear RH side). The power window regulator motor assembly (for rear RH side) has motor, regulator, and ECU functions. If the pulse sensor built into the power window regulator motor (for rear RH side) malfunctions, the power window control system enters fail-safe mode. The remote up/down and auto up/down functions cannot be operated during fail-safe mode. 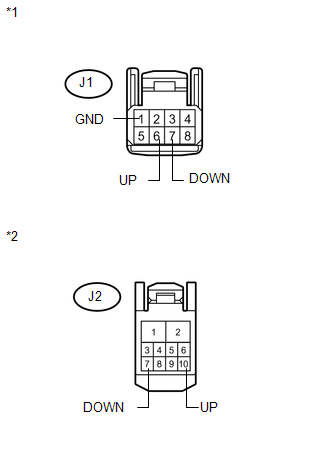 However, the power window can be closed by holding the power window regulator switch assembly (for rear RH side) at the auto up position, and opened manually by pushing down the power window regulator switch assembly (for rear RH side). system after confirming that the communication system is functioning properly. 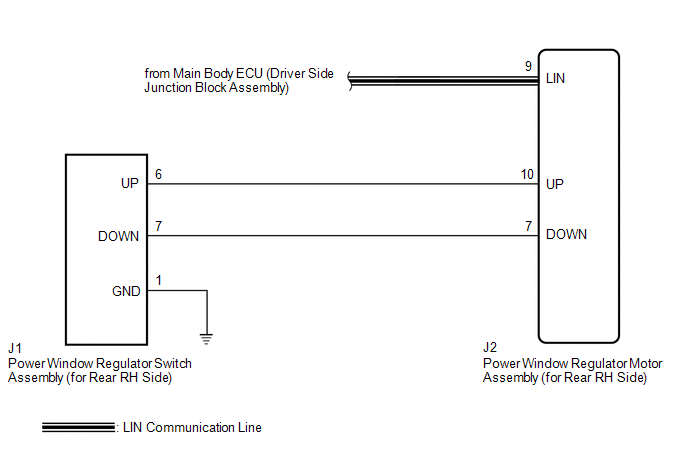 When the power window regulator motor assembly (for rear RH side) is reinstalled or replaced, the power window control system must be initialized. Close the power window by fully pulling up the power window regulator switch assembly (for rear RH side) and holding it at the auto up position. Open the power window by fully pushing down the power window regulator switch assembly (for rear RH side). When the ECU determines that the power window regulator motor assembly (for rear RH side) has a malfunction, DTC B2311 is set. (e) Read the Data List according to the display on the Techstream. On the Techstream screen, OK is displayed. (a) Enter the following menus: Body Electrical / RR-Door Motor / Data List. (b) Read the Data List according to the display on the Techstream. On the Techstream screen, ON or OFF is displayed accordingly. (a) Enter the following menus: Body Electrical / RR-Door Motor / Active Test. (b) Perform the Active Test according to the display on the Techstream. Rear RH power window operates normally. Be careful to avoid injuries as this test causes vehicle parts to move. During the Active Test, the jam protection function will not operate. (a) Remove the power window regulator switch assembly (for rear RH side) (See page ). 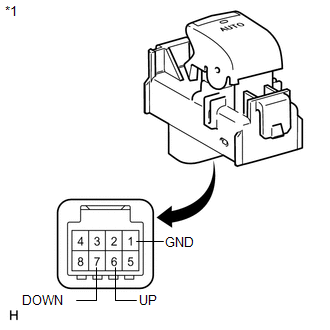 (a) Disconnect the power window regulator motor assembly (for rear RH side) connector.